The volume “Renewable Futures. Art, Science and Society in Post-Media Age” is out, edited by Rasa Smite, Raitis Smits and Armin Medosch with contributions by Domenico Quaranta, Martha Buskirk, Miško Šuvaković, Dieter Daniels, Andreas Broeckmann, Geoff Cox, Jacob Lund, Ieva Astahovska, Karla Brunet, Oksana Chepelyk, Edith Doove, Gabriela Galati, Julian Hanna, Lisa Jevbratt, Normunds Kozlovs, AnneMarie Maes, Conor McGarrigle, Armin Medosch, Jennifer no.e Parker, Daniela de Paulis, Helena Sederholm, Ilva Skulte, Rasa Smite, Raitis Smits, Vygandas “Vegas” Šimbelis, Isidora Todorović, Polona Tratnik and Fields exhibition artists. RIXC comes out with the newest book in Acoustic Space edition – Renewable Futures. Art, Science and Society in Post-Media Age. With this Renewable Futures volume, RIXC begins a new series of Acoustic Space, that will focus on exploring the transformative potential of art in the post-media age. Book will be presented on April 28, in Eindhoven, during second Renewable Future conference and on May 3 in Riga, during the opening of the new RIXC gallery, in Lencu iela 2. Acoustic Space comes out as an international peer-reviewed journal for transdisciplinary research on art, science, technology and society. Acoustic Space Nr. 16. Renewable Futures. Art, Science and Society in Post-Media Age. With this Renewable Futures volume, we begin a new series of Acoustic Space, that will focus on exploring the transformative potential of art in the post-media age. Our book presents the research and practices that aim to invent new avenues for more sustainable and imaginative future developments. 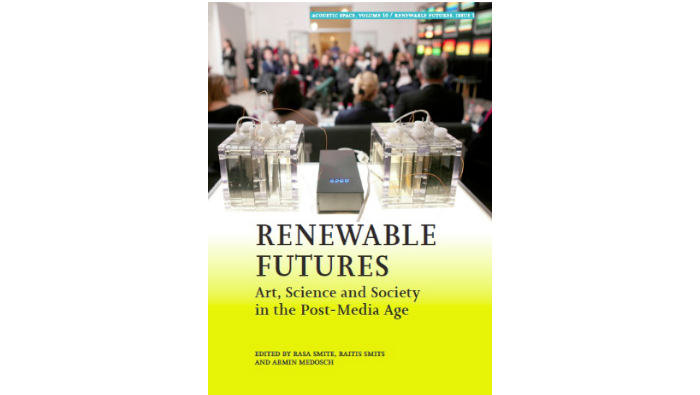 The papers from the 1st Renewable Futures Conference selected in this volume are aimed at shaping new contact zones between traditionally separated domains – art and science, academic research and independent creative practices, sustainable businesses and social engagement in the 21st century. The first chapter highlights the role of technology, considering “technopolitics” as a very profound perspective for the contextualisation of an art practice in the current phase of society. The second chapter introduces the notion of “contemporary conditions” and discusses theories and practices of “post-media”, “post-internet” and other “posts”. The third chapter looks at artistic engagement with different fields of science, ecological issues and interspecies relations, while the fourth chapter discusses yet another role which artists have been active in – partaking in collecting and coding, manipulating and retransmitting processes. The closing section includes an overview of the Fields exhibition (Riga 2014), a large-scale post-media manifestation, jointly curated by Armin Medosch, Rasa Smite and Raitis Smits.